The money’s in the list, marketers like to say. Across companies and industries, they rank email marketing as the No. 1 tactic for driving awareness, client acquisition, conversion, and client retention, according to Gigaom Research. Email marketing introduces leads to you and your business, answering their questions and challenging their potential objections. Most leads aren’t ready to buy at the moment they arrive on your website or even when they sign up for your email list. Email helps you gradually warm up the lead so you can ask for the sale—and later, the upsell, repeat sale, and referral. If you actually have an email list, that is. At one point, every business started with a list that wasn’t worth a dime. Building it into a money-maker isn’t a one-time event or a strategy involving a single tactic. Whether you have 100 subscribers or 100,000, list building is a neverending work in progress. In this guide, we’ll share strategies and tools for growing your email list, categorized by your current list size and ordered by approximate level of marketing sophistication. If you haven’t done much email marketing before, you’ll want to start at the beginning. But because there’s no exact formula for list building based on your number of subscribers, even more experienced email marketers should review the complete set of strategies. Read on for ideas that will help you grow your email list and your business. Try Keap free for 14 days to see how you can use it to grow your email list. If you’re going to have a real email list, you need a tool that can truly handle email marketing. BCC-ing a cut-and-paste list of contacts might work when you’re just starting out, but Gmail and Yahoo aren’t scalable solutions for a business looking to grow through email marketing. A basic email marketing tool allows you to import contacts, design emails, send mass messages to your list, and capture new email addresses through an opt-in form. Keap builds on those capabilities by adding customer relationship management (CRM) to help you keep track of every important detail along the client journey. A CRM helps you organize contact information, take client notes, and keep track of client interactions like link clicks and email opens so you can tell which leads are most interested in your business. With automation, you can automatically trigger emails to be sent based on actions taken by a contact, like clicking a link, filling out a form, or making a purchase. Anyone who visits your website should know you have an email list. With email marketing tools, you can generate HTML code for an opt-in form to be inserted onto your website. While it’s best to solicit email sign-ups in more than one place (see next section), adding a form to the bottom of your homepage is a good place to start. Even a new business shouldn’t have to start from scratch when building an email list. Be sure to invite people you know—whether they’re members of a networking group or simply members of your family—to sign up for your emails. Having subscribers will help you get in the habit of email marketing and help you optimize your tools, content, and strategy as you grow. If you’ve been in business for awhile, send an email inviting past clients to opt into your list. You’ll only want to email clients who truly want to hear from you—and besides, it’s the law. In the United States, the CAN-SPAM Act makes it illegal to send unsolicited, commercial email in bulk. Even if you have a client’s email address, you need her explicit permission to send her mass messages. By forcing people onto your list, you run the risk of your emails being reported as spam, which will hurt your email deliverability in the future. Growing a list requires adopting a list-building mentality wherever you go. If your business has a physical location, or if you’re meeting new people at a networking event, ask them if they want to subscribe. In doing so, describe what’s in it for them, explaining whether you regularly send content, promotions, event notices, or all of the above. See how Keap's smart client management works. If your only email opt-in form is at the bottom of your homepage, what about people who never scroll that far? Encourage more sign-ups by adding more calls-to-action (CTAs) throughout your website and marketing materials. Add links to your email sign-up form in places like your homepage header, on your product or services pages, and within blog posts. You can also mention your email list on your social media pages and change the CTA on your Facebook cover photo to “sign up.” And with a pop-up tool (see next tip), you bring the CTA to web visitors wherever they are. Pop-ups can appear in the middle, on the side or on the bottom of your website, showing up as soon as a visitor arrives or, in the case of exit-intent pop-ups, as late as when a visitor is about to leave your site. Several pop-up tools integrate with Keap, allowing you to import email addresses from the pop-up directly into your CRM database and automated email campaigns. You don’t have to list every detail on your website. In fact, you might collect more email addresses if you don’t. Consider asking people to provide an email address to access key pieces of information, like your pricing list or a schedule. Without client management software, you’d have to manually send the information to each person who requested it—a tedious task with plenty of room for error. With a tool like Keap, the software can automatically send the information, along with subsequent emails that answer questions and further encourage leads to buy. Have you ever signed up for an email list to get 10 percent off something you were about to buy? Sure. Almost everyone likes a good deal. But have you ever signed up for the list only to unsubscribe immediately after placing your order? Probably. Almost everyone gets too much email. Promo codes can provide a quick, effective way to add subscribers to your list. But they’re not necessarily effective in keeping them there. If you do offer a promo code, be sure to explain what your future emails will entail (like exclusive offers or weekly tips) so that clients understand the value of staying on your list. Learn more about making a first email impression in The Perfect Welcome Email: How to Introduce New Email Subscribers to Your Business. Depending on your business, you may not want to offer a discount to every new subscriber. But by hosting a contest, you can give away just one prize—while collecting many more email addresses. Of course, some subscribers will only join your list for the free stuff, not for your actual offerings. But automation can help you make the most of your time together. After a lead enters the giveaway, you can send a series of automated emails explaining your business and its benefits. And after you choose a winner, you can offer the other entrants a discount on the same product or service they were trying to win. See How to Capture More Leads to learn a process for hosting a giveaway. Wondering if Keap is right for your business? See a quick demo to see how it works. Plain text email vs. HTML email—Which is better? Wondering whether to send plain text or HTML emails? We explore the pros and cons of both types in this article. To get an email address, it’s best to give something in return. For many businesses, that “lead magnet” is a piece of high-quality content: an e-book, white paper, case study, checklist, cheat sheet, infographic or other piece valuable enough that the lead would provide her email address in order to download it. For a content piece to be valuable, it should address the specific problem that would compel the lead to consider your business in the first place. In providing a guide, tutorial, or other helpful information related to the solution, content helps leads make an educated buying decision—while positioning you and your company as the experts. A tool like Canva can help you design a content piece with free photos and graphics, while software like Keap automatically delivers the content, along with related follow-up emails. For 19 ideas about content and other types of lead magnets, read The Small Business Guide to Capturing Leads. One key is segmentation, the act of dividing your list into a number of smaller, similar subsets. For example, you might create different segments for leads, clients, and people who bought specific products. When you email segmented groups instead of your entire list, your messaging can be more personalized. And when emails feel relevant, subscribers are more likely to open them—and stay on your list. Read How to Best Use Email List Segmentation to learn more. No one takes an online quiz without wanting to know their results. That’s why quizzes make for effective lead magnets. When, at the end of a quiz, a lead is asked for an email address to see her outcome, she may already be invested enough to give it to you. Quiz apps like Interact, Dilogr, and LeadQuizzes integrate with Keap, allowing you to collect leads and automatically follow up via email with information related to quiz results. Plus, quizzes help you learn about your leads so you can better tailor your follow-up to meet their interests and needs. Check out How to Use Quizzes to Score and Qualify Your Leads for more details on using quizzes for sales purposes. If you have a high-quality content piece to use as a lead magnet (see the last section if you don’t), you need people to discover and download it. One answer: more content. Your blog shouldn’t exist only for the sake of having a blog. Each blog post should drive people toward your ultimate goal: collecting email addresses so you can continue marketing to them. When planning a lead magnet, consider blog posts that could serve as additional advertisements for the downloadable piece. For example, a blog post covering one specific tip can promote your “content upgrade,” an e-book with 10 more tips along those lines. Or create an easy-reference version of a long blog post by offering a downloadable checklist or cheat sheet. Blog posts create more entry points to your lead magnets through your website, search results, and social media channels. Plus, a person who reads your blog post will get a feel for your business and expertise, making them more likely to trust that the download is worth their email address. There’s one surefire way to get more leads to your website: paying for it. But if you’re buying Google AdWords or Facebook ads without capturing email addresses from new visitors, you’re essentially buying a digital billboard for your business. Someone might click on your ad once, only to get distracted and never return. Without their email address, you can’t follow up to send more information (and remind them your business exists). You’ll get a better return on your advertising investment by collecting email addresses through a lead magnet like a content piece or discount. Link your ad to a landing page, not your homepage, to keep people focused on your objective. Or use Facebook Lead Ads, which use forms pre-populated with Facebook user data and can connect to Keap through apps like Zapier, SyncSumo, and PlusThis. For a step-by-step look at configuring and optimizing Facebook ads, check out The Ultimate Guide to Capturing and Converting Facebook Leads. Video might be the next best thing to a face-to-face conversation, helping people build trust in your business as you demonstrate your products, services, or expertise. And it can help you capture more email addresses, too. To make a video into a lead magnet, you can simply a send a video link to those who complete a form requesting it. Or you can make email capture part of the video-viewing experience with a platform like Wistia. With Wistia’s Turnstile feature, you can collect email addresses at the beginning, middle, or end of your video, then automatically import those leads into Keap to for additional email follow-up. See the Keap + Wistia Guide for Small Business Video Marketing to learn more. Give prospective clients an in-depth preview of your expertise by sharing a presentation, tutorial, or Q&A interview in a webinar. Most webinars require advance registration, so consumers are accustomed to sharing an email address in order to attend and gain useful information. Automation is key to hosting a webinar, which requires a sign-up process, reminders before and at the time of the event, and follow-up emails, which often include a recording of the webinar for those who missed the live version. A number of apps can connect your webinar platform with your marketing automation tool: PlusThis and WebinarCore are among those that connect Keap and GoToWebinar. To learn webinar basics, see our Guide to Hosting a Webinar. Use our step-by-step guide to help you create the perfect welcome email and improve your sender reputation. Now that you have someone's email address, it’s crucial to make sure that your next communication sets the right tone. How do you make sure you’re rolling out the right digital welcome mat? It starts with the subject line. A speaking engagement at a conference or industry event may be a lead magnet in itself: Give a good enough speech, and audience members will seek you out for business opportunities. But rather than wait for the phone to ring once you’re back in the office, you can proactively collect leads while you’re still on stage. Once again, it comes back to the lead magnet. To compel audience members to share email addresses, you need to offer something of value—even if it’s simply the slides from the presentation you’re giving. Ask audience members to visit a landing page for the lead magnet, sharing the URL in the footer of your slides. Or use an app like Fix Your Funnel or CallLoop to facilitate opt-ins via text message, following up with an email when the leads are automatically added to Keap. Publishing content on your blog helps you connect with prospective clients—and so does writing for someone else’s site. Guest blogging allows you to share your expertise with new readers while also creating valuable links to your website. These “backlinks” tell search engines that your site is worth visiting, helping your business get discovered in search results. Find industry websites or blogs complementary to yours and ask if they accept guest posts, describing what you’d cover and how your post would benefit their readers. If links are allowed in your post, use them strategically to drive traffic to certain pages—like a landing page for your lead magnet, where you’ll collect email addresses from people who discovered you through the guest post. Wish you could just take an email list from another business with subscribers similar to the ones you want? Don’t do that, even with their permission: Email marketing must be permission-based, so your emails are likely to be considered spam if you contact someone else’s customers without being invited to their inboxes. But do consider potential partners in your list building efforts. Invite another business to co-create a content piece, webinar, or giveaway and promote it alongside you. Or you can trade services: You promote their webinar this month, and they promote yours next month. With a partnership, both businesses get in front of new leads—ideally, without paying anything to collect their email addresses. If you have a number of online courses, videos, or other content pieces to share—and to sell—consider hosting them on a site with members-only access. The catch, of course: access requires an email address. A membership to your site doesn’t necessarily need to be a paid one to start. Offering a free trial or a limited number of free resources can attract leads to check out your site, where they’ll see additional content available for purchase. Sometimes running an email campaign can have the proverbial “throw it against the wall and see what sticks” kind of feeling. Here are some ways to make that process a little less unpredictable. 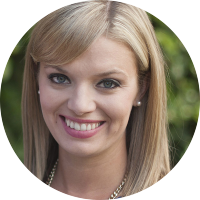 Amy Saunders is a senior content creator at Keap, where she writes content that inspires and empowers small business owners. Writing about business brings Amy’s work full circle: She began her career as a business reporter at The Columbus Dispatch in Ohio before becoming a features writer. After more than six years there, she moved to Phoenix, where she was an editor at a content marketing agency before joining Keap. Amy’s mission to help small businesses succeed reaches far beyond work hours: She spends most of her free time overseeing the marketing efforts for Strolleria, her husband’s baby gear start-up. Sign up for a demo today to see how Infusionsoft can help you grow your email list.